Girish Kumar Krishnan began playing video games after experiencing a massive culture shock when he and his family moved to the rural parts of the U.S. in 1998 from the crowded city of Thiruvananthapuram, Kerala (India).Krishnan, a Georgia State student, said he didn’t have any idea of what America was like because he and his family were only used to seeing the U.S. on TV, which was primarily depicted like New York City. “So we thought we were coming to the future; [we imagined there was] going to be robots and skyscrapers,” he said. Krishnan said he felt powerless by these changes, especially when his family later moved to Suwanee, Georgia. These changes resulted in feelings of social isolation. Krishnan continued playing video games throughout high school, still feeling as though he had a sense of his own environmental control. However, things changed when gaming began to affect his grades in college and he began losing his own self control by developing a video game addiction. “I noticed I always had problems with finishing things, procrastination, attention and started looking into why that might be,” he said. After failing organic chemistry, Krishnan said he decided it was a time to not only stop playing video games but figure out why he had let them impact his academic career. 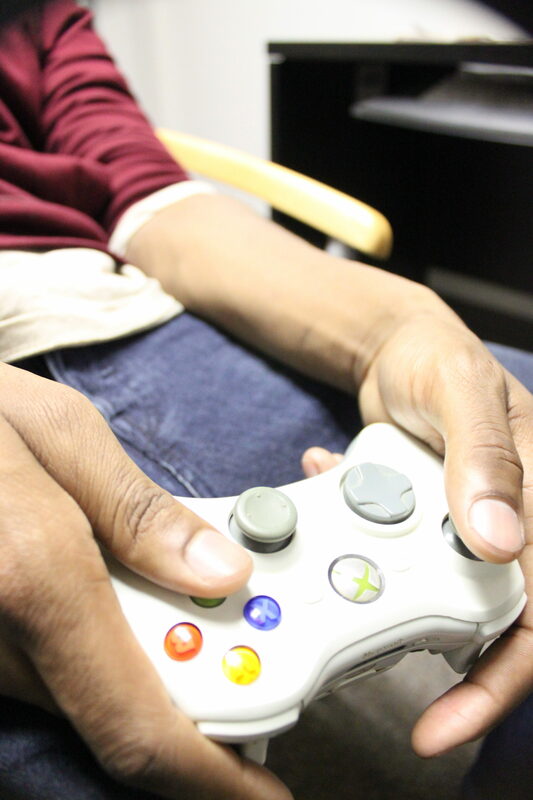 Krishnan is now a graduate student at Georgia State pursuing a masters degree in Mental Health Counseling and interns at a facility to treat patients with video game addictions. Krishnan works with licensed counselor Thomas Andre at Warnecke Professional Counseling which is currently run by Licensed Professional Counselor (LPC) Andrew Warnecke. Warnecke Professional Counseling, located in Marietta, provides counseling to patients with game addictions through a program called Reboot, according to the center’s website. 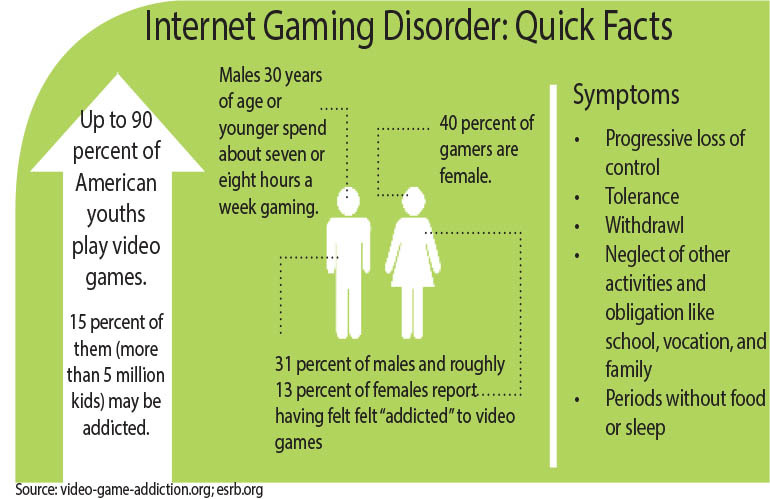 The official name for problematic gaming is listed in the Diagnostic and Statistical Manual of Mental Disorders: Fifth Edition (DSM-5) as “Internet Gaming Disorder” (IGD). The symptoms of IGD are similar to those of drug and alcohol abuse, according to Andre. “[Symptoms include] failed attempts to control it yourself, very similar to drug and alcohol problems — heightened sense of euphoria while playing. That’s the people that get so ingrained — so focused — that hours can pass by before they realize how much time they wasted and maybe they didn’t do their homework,” he said. Andre also said symptoms include cravings, neglecting social outlets and obligations, restlessness from not playing and dishonesty about the amount of time individuals play or about their behavior with it. People with IGD go to extreme circumstances to continue gaming, according to Andre. Krishnan said people develop problems with video games because they are trying to escape from something in their lives. He also said the addiction is often correlated with associations of escaping their real-world problems. Andre said for people that are shy, gaming can also be an outlet for them to talk to people or be part of group interaction. “You don’t know me, anonymity. You can’t see me, invisibility. See you later, asynchronicity,” he said. Krishnan said IGD and Attention Deficit Hyperactivity Disorder (ADHD) are often bidirectional. 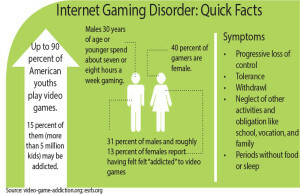 However, he also said not all gamers are addicts. Andre said the professional method of treating patients is through psychology-based education. He and Krishnan are currently treating five patients who are three weeks into an eight-week group program. “It’s a process group for people to talk about their own lives, talk about what’s going on in their lives, why they do what they do,” he said. Andre also said he has seen approximately one hundred patients in the three years since he’s been working with IGD. After graduation Krishnan intends to continue research on IGD, human attention and the impact of technology on our neuropsychology. Krishnan said his belief that psychology is used in games to encourage people to keep playing and pointing this out to his patients can be a catalyst for change. Those with an addiction to gaming and want to stop should have hope, according to Krishnan. “They might think it’s hopeless, that they can’t ever break these cycles or that they are losers… You can change and science says you can too,” he said. Psychology behind the games and addictionKrishnan said people develop problems with video games because they are trying to escape from something in their lives.“Escapism is a factor,” he said. “If they feel powerless in their own lives or have little power over their environment, or [are] just anxious or agoraphobic sometimes … all of these things lends itself to problems with video games because they can almost self medicate with video games.”He also said the addiction is often correlated with associations of escaping their real-world problems. Krishnan said the games he had the greatest problems with were Defense of the Ancients (DOTA) and League of Legends (LoL). Krishnan also said it is his opinion that playing LoL is similar to gambling because to you can either gain or lose points depending on whether you win or lose battles. Andre said people get hyper-focused on games because of how engaging they are. Not only himself but Krishnan said he saw how video games affected those around him negatively. He and Krishnan are currently treating five patients, who are three weeks into an eight-week group program. Krishnan believes that psychology is used in games to encourage people to keep playing, and pointing this out to his patients can be a catalyst for change. Krishnan said these are the things he is pointing out to his patients because understanding why an individual keeps playing can be a catalyst for change. “When I explain these things they start to change because they now understand. They have a concept of what is going on. Usually it’s people just telling them, ‘Hey, stop playing video games. It’s bad for you,’” Krishnan said. Krishnan said an important keys to recovery are awareness and mindfulness. “Using mindfulness to practice being here sitting with their thoughts, their pain might help them move past that.” Krishnan said. Krishnan said people that have a problem with gaming and want to stop should have hope. The article that you wrote will help bring to light an issue that remains so hidden for some and obvious to others. It is one reason why, I believe, that internet gaming/problematic computer use and abuse remains “the hidden illness” because in some ways it has been right under our noses. It has crept in our lives in the dark and needs to be brought out into the light. I wanted to let your readers know that there is help out there. They don’t have to go it alone.